The South African contact centre industry has evolved to such an extent that it is becoming the focal point for corporate sales, service, and support. Factors like cloud computing, data analysis, and outsourced managed services indicate that the coming months will be crucial for growth. 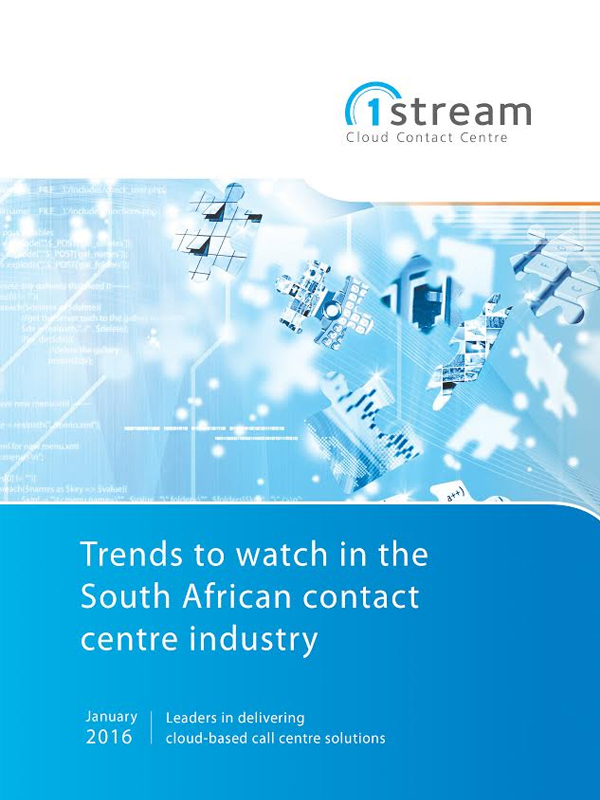 This is according to the new annual 1Stream White Paper examining the 2016 trends in the South African contact centre industry. 1Stream founders, Bruce von Maltitz and Jed Hewson, believe that with telephony and connectivity costs steadily decreasing in the last few years, companies can grow their business using a host of innovative technologies. “Perceptions exist that being a developing market, South Africa is lagging behind its First World counterparts. Yet this could not be further from the truth. By examining how local contact centre environments operate, it is clear that their approaches are not markedly different to what is happening in other parts of the world,” explain von Maltitz and Hewson. Since the 2012 key trends White Paper, South Africa remains a good destination for multinationals to choose as a base for contact centre operations – influenced by a weakening currency and an ICT market that is conducive for growth. Cloud computing has been the most impactful driver in the contact centre market. With the evolution of the CIO’s responsibilities, the shifting role of an in-house IT department has materialised. And despite the anticipation two years ago that home agents would play an important role in the evolution of the contact centre, the potential of this trend has been limited by a more traditional-minded approach across the industry. Increased affordability of devices and data has seen the growth of smart devices, mobile clients stay on an upward trend, and the adoption of cloud-hosted solutions continued to increase while many organisations are still struggling to manage or phase out their legacy systems and hardware. According to the 2016 White Paper, cloud computing is becoming mainstream in the contact centre industry. The technology has simplified products and services resulting in the opportunity for decision-makers to take a fresh approach towards cloud-hosted solutions and the associated cost and efficiency benefits. “Most times, the contact centre is the only human touch point for a business and is therefore a business focus area that can offer consistent, measurable business information for analysis,” say Maltitz and Hewson. The resultant focus on data growth also means that contact centre executives are relying on more advanced tools to analyse what they have at their disposal. By extracting real-time data intelligence, they can move beyond just monitoring the performance of a contact centre into having meaningful, high-level information. This provides for a more competitive environment driven by advanced reports that are informed by real-time customer data. “Aspects like HTML5 and WebRTC driving application usage, Omni-channel environments reflecting the numerous customer touch points with a company, and the Internet of Things creating an explosion of connected devices, all indicate that contact centres today need to be able to adapt quicker to different ways of doing things. By ignoring what is happening from an ICT innovation perspective, executives risk falling behind and trying to catch up to what their competitors are doing,” warn von Maltitz and Hewson. IT services are changing while technology is becoming more niche. This requires specialist skills to extract value. After all, having access to Information and Communication Technology (ICT) is just one component. The 1Stream founders believe that contact centre decision-makers need to embrace an outsourced managed services approach to leverage knowledgeable professionals in a more cost-effective manner. “In the digital landscape today, the rate of change will only accelerate. Contact centre executives, therefore, must not only be aware of these shifts but must openly look at ways of adapting them for their business environment. After all, it is not so much about the technology but rather the fact that change needs to happen sooner rather than later,” conclude von Maltitz and Hewson.